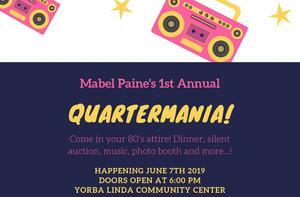 Also, Mabel Paine PTA will be hosting our 1st 80's-themed Quartermania event on Friday, June 7 from 6:00 - 11:00 PM at the Yorba Linda Community Center! Quartermania is a fun, entertaining cross between an auction and opportunity drawing. We will have over a hundred exciting prizes and gifts worth thousands of dollars available for you to bid on with quarters. Yes, QUARTERS! Bids are pre-determined and range from one quarter to four quarters per auction item. If you decide to bid on an item, you hold your paddle up high and if the auctioneer pulls your paddle number out of the bucket you WIN! Click the PDF below to learn more.